Tom and I met years ago in Washington, DC, where politics influence every aspect of daily life. We were on hand for more than one presidential inauguration, and went to an inaugural ball together. Four years ago, in Wisconsin, we decided to host our own inaugural “ball,” a sit-down dinner for a dozen friends in formal dress. It was a huge success, if we do say so. We disguised our deck table with a damask tablecloth for extra seating, and had lots of flowers and candles. We had so much fun that we decided to repeat it this year. I wanted to make something this side of elegant, but that wouldn’t have me in the kitchen all evening while the guests were mingling. Something I could prepare mostly ahead of time, but wasn’t as casual as a stew or casserole. Something not overly rich, so as not to disrupt any post-New Year’s intentions of healthy eating. Pork tenderloins are very lean and quick to prepare. To gussy them up, I roll-cut them flat and reassembled them with a spiral of aromatics and bright green herbs. The stuffing not only looked elegant, it added rich flavor to the mild meat. Since the tenderloins benefited from a rest in the fridge before cooking, I could do all the prep in the morning. 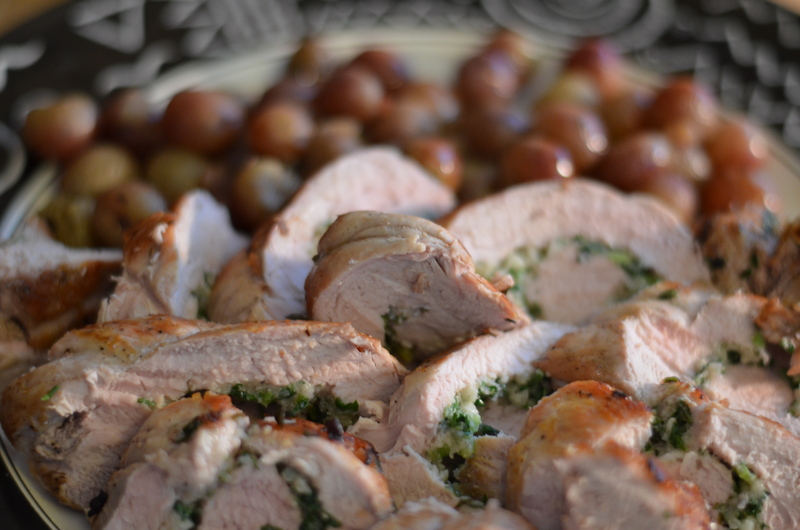 I roasted grapes right along with the pork, but you can certainly roast the grapes separately, or leave them out altogether. The winy fruit is an unexpected, subtly sweet complement to the pork. To balance that fruity flavor, I whisked some dijon mustard into the sauce at the end. We put out parmesan-pistachio shortbreads to nibble on beforehand, and served the tenderloins with roasted shallot smashed potatoes (which hold very well in a slow cooker on low, by the way). Our guests brought a smoked salmon appetizer, a green salad, and a chocolate zucchini cake decorated like a flag with strawberries and blueberries. Good friends and good food–it was, overall, a lovely way to usher in the new year. Although you can stuff the pork and cook it immediately, it’s best if you can prepare it several hours in advance. In a small bowl, stir together the shallots, garlic, celery, celery leaves, thyme, parsley, lemon zest, panko, and 2 tbs. of the oil. Season with salt and pepper. Cut two long pieces (about 36 inches) of kitchen twine; set aside. Trim fat and silverskin from the tenderloins. What we’re doing now is transforming a cylinder of pork into a 1/2-inch-thick rectangle of pork. Lay one tenderloin on your cutting board perpendicular to you. Hold a long, sharp knife parallel to the cutting board about 1/2 inch above it. Cut into but not all the way through the length of the tenderloin. Roll it open and make another cut in the thicker part, where the first cut ended. Roll it open again and continue until you have a rectangle of meat roughly 1/2-inch thick. At this point you can cover it with plastic wrap and pound it lightly to make it thinner, but it’s not necessary. Repeat with the second tenderloin. Season the meat well with salt and pepper. Spread half the herb mixture over one tenderloin. Gently roll the tenderloin up, taking care not to squeeze out the stuffing. Tie the roll snugly every inch or so, tucking in the edges as you go. Repeat with the second tenderloin and the remaining stuffing. Wrap them well and stash in the fridge for up to eight hours. About an hour before dinner, heat the oven to 400 degrees F. Place a very large (12-inch) skillet* or cast iron pan over high heat and add the last tablespoon of oil. When the oil is shimmering but not smoking, season the outsides of the pork with salt and pepper and add them to the pan. Sear them for about 5 minutes per side until they’re well-browned. Add 1 cup of the stock to the pan, give a quick stir to loosen up the browned bits. Scatter the grapes around the tenderloins and put the pan in the oven. Roast uncovered until the thickest part of the tenderloin reaches 150 degrees on a meat thermometer. At this temperature the meat will be tender, safely cooked through, and slightly pink in the center. If that pink makes you nervous, give it another 5 minutes. Remove the tenderloins to a platter. Using a slotted spoon, remove the grapes and add them to the platter. Cover with foil and set aside in a warm place to rest while you make the sauce. Place the pan over high heat and stir in the remaining cup of stock. Boil for a few minutes until the flavors are concentrated and the sauce is slightly thickened. Whisk in the mustard. If you want a thicker sauce, you can mash together a tablespoon of soft butter with a tablespoon of flour and whisk it into the sauce. Slice the tenderloins about an inch thick to show off the pretty swirl of herbs. Serve with the grapes tucked around the slices, and the sauce on the side. 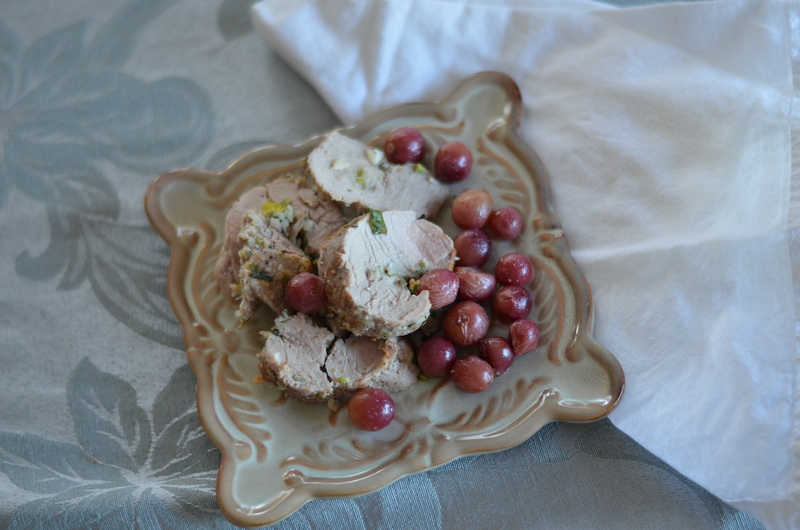 This entry was posted in appetizers, meat, poultry,and fish and tagged grapes, healthy, herbs, low-fat, pork. tenderloins, roast. Bookmark the permalink.